This $2,500 college scholarship is given annually to a Rhode Island high school senior who demonstrates philanthropic spirit within the community. Students expected to graduate from a certified Rhode Island high school in June 2019 are eligible to apply. Applications and supporting materials must be typed. No bound documents (use staples or clips) or videos will be accepted. Supporting documents should not exceed 5 pages. The recipient of the scholarship will be announced in Fall of 2019. The application will be posted in the coming months, be sure to check back for more information. To ensure that you don't miss anything, please join the mailing list by emailing the office your request at info@afpri.org. Demonstrated commitment to improving the quality of life for others in Rhode Island through active participation in volunteer and philanthropic activities. Demonstrated capacity to inspire and motivate others to serve as community volunteers and to fundraise for community needs. Demonstrated commitment to volunteerism and philanthropy through personal involvement to a significant degree in a specific non-profit community organization (e.g. homeless shelters, food banks, hospitals, assisting the handicapped and others in need, and neighborhood projects). The award is named in memory of Herbert E. Kaplan, a Rhode Islander well noted for his service to the community. The goal of the scholarship is to promote future leadership in volunteerism and philanthropy and support the higher education of the award winner. It is the hope of AFP-RI Chapter that the award winner's chosen education area will nurture a continued interest in community service through volunteerism and philanthropy. 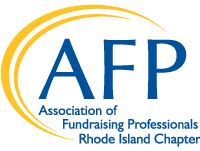 The $2,500 scholarship is funded by the Association of Fundraising Professionals - RI Chapter and the Herbert E. Kaplan Fund at the RI Foundation. The $2,500 scholarship will be awarded on November 16, 2018, during the AFP-RI Chapter National Philanthropy Day celebration, to support the higher education of the award winner. The scholarship must be used by June 30, 2019. For questions, please contact the AFP-RI Chapter 401-461-3863 or info@afpri.org.